Proloquo2Go is an award-winning symbol-based communication app that gives a voice to those who cannot speak. Over 200,000 people already use this AAC app as a powerful tool for expressing themselves and increasing their communication skills and language development. Its innovative features let users, parents, teachers and therapists quickly personalize the app. 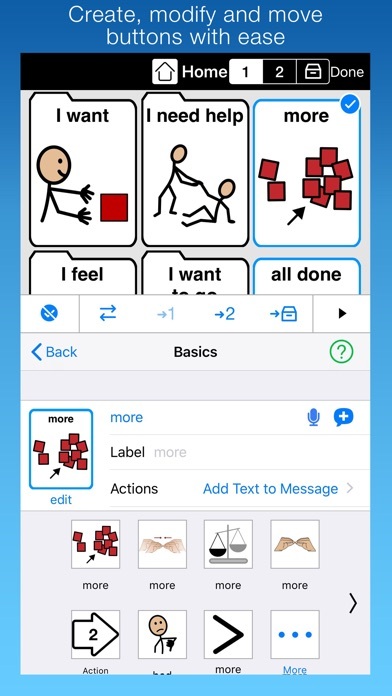 Proloquo2Go is an AAC (Augmentative and Alternative Communication) app used by people with autism, Down syndrome, cerebral palsy and other diagnoses. It is available in English, Spanish, French, and Dutch for iPad, iPhone, iPod touch and Apple Watch. “Users can open Proloquo2Go and begin to use it for effective communication immediately” – Susan Berkowitz, MS-SLP, AAC Consultant. Feature highlights • Crescendo™, a complete research-based core word vocabulary with 10,000+ fringe words • Quickly and easily customizable – everything from the vocabulary to the appearance • Designed for a range of fine-motor and visual skills with options like 23 pre-programmed grid sizes • Use your regional vocabulary and accent with British, Australian and American English, Parisian and Canadian French, Castilian and American Spanish, and Dutch and Flemish. The app also supports bilingual use, and you can even switch languages mid-sentence • 100 natural-sounding free voices across all languages, including children’s voices Research-based Proloquo2Go puts the user’s development first with features based on clinical knowledge and user research. Studies show that just 200-400 words make up 80% of what we say – known as core words. Combined with best practices like modeling, teaching core words has been shown to grow language and communication skills. Our Crescendo™ vocabulary is based on this insight and puts core words front and center for easy access. 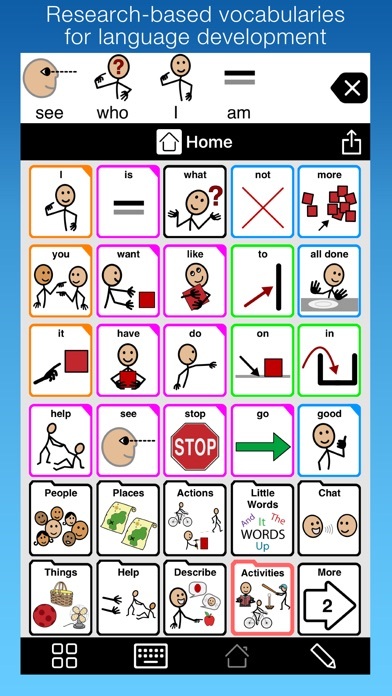 Grows communication skills Proloquo2Go is one of the few AAC apps designed to support all users, from beginning to advanced. 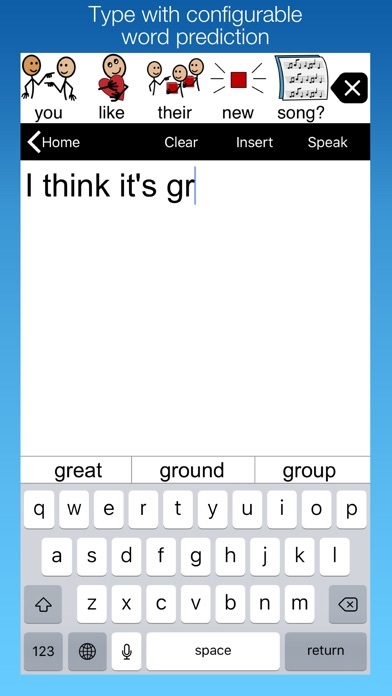 This lets someone develop from single words to full grammatical sentences in the same app. With over 10,000 words available, there’s no limit on what you can say. Our Progressive Language feature reveals words step by step. 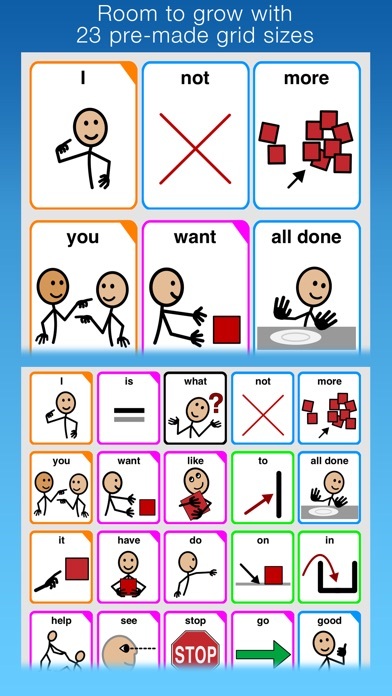 This helps communicators learn words and their location as their vocabulary gradually grows. Research has shown that consistent placement of objects supports easy recognition, known as motor planning. With this in mind, Proloquo2Go's thematic templates keep core words in the same places throughout the vocabulary. This helps communicators by reducing time wasted trying to find words. Easy customization and accessibility Buttons, pages, navigation and access - the whole app is customizable. With just a few taps, you can make it suit both vocabulary and accessibility needs. For the most important things to you, you can add your own buttons. The app comes with more than 25,000 symbols for new words – but you can use your own photos too. Accessibility settings support scanning and Apple’s VoiceOver, for users with fine-motor challenges and vision impairments. These make the app work with how you’re comfortable using it. Comprehensive support We’re there for you every step of the way. Help articles in the app are there whenever you need them. New to AAC? Our website has background resources in the Learn AAC section, and the AssistiveWare Core Word Classroom includes activities for teaching AAC effectively. You can also connect directly with our AAC community on our Facebook groups. If you have any questions, our support team is available 7 days a week, and is happy to help. Discounts available with Apple’s educational Volume Purchase Program – 50% off on 20 licenses or more. 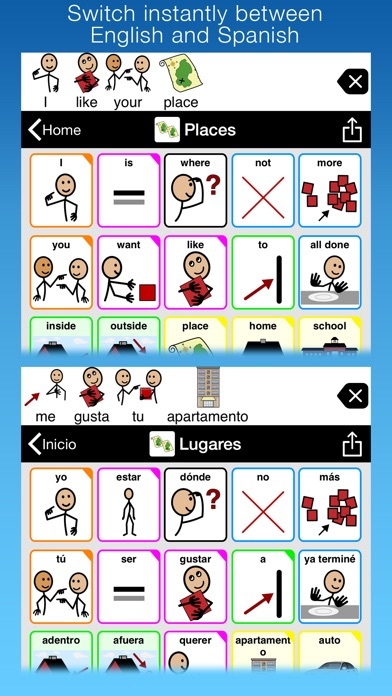 Joan Bruno’s Gateway to Language & Learning© vocabulary is available as in-app purchase (English only). Purchased for a different reason than most: to learn Spanish—it seems to work great for that! Love the long-press to get verb tenses and more. Since I’m a visual learner, the symbols for Spanish words reinforce learning. I get the spoken voice for each word and also the entire sentence. Also enjoy Keeble Spanish keyboard as well. If you’re wondering if you can use it to learn another language, I would say yes—get it while it’s half price! For those people seeking trying to find a better aac app, this app is a must! Its all here super easy to use and my son will gonna use it for the rest of his life! 100 % would recommend this app! You guys wont regret purchasing this app, its super awesome!!! We purchased this several years ago for my son, he also uses it at school. After adding folders/vocab words only to have him delete them, I’m giving up. Plus, the interface is so overwhelming it’s hard for him to find the right words to use. Disappointing, I really wanted this to work. Happy that such an app exists. Our toddler who we suspected to be on the spectrum before his second birthday has been using this app for about the past 6 months. He turned three not long ago and has been learning how to communicate using the app with the help of his therapists. I really like that it can be customized for early learners such as my toddler. The only reason I give it four stars is because he uses this app on the iPad, but for some reason he has trouble swiping up/down for some reason even after we try to show him over and over again. We were told it’s probably a fine motor issue. For now, we all swipe the page for him to access the rest of his icons. I would love it if the ability to swipe left to right were included since he is able to do that with no problem. I love this app!! I am constantly amazed at it! %100 worth the price (which i admit frightened me a little) i’m autistic and have made such great strides in communicating and i love this app so much!!!! Great app. You get a lot for what you pay. I’m autistic and I have seizures as well as SPD and complex PTSD. I have Fibromyalgia, lupus and ME (chronic fatigue if you don’t know what it basically is.) and many other diagnosis. This app has helped me communicate when I can’t. I am verbal but some situations cause me to lose my ability to talk. Great quality, great vocabulary, wide selection of voices to choose from. All around great app for anyone with a need to use an AAC.